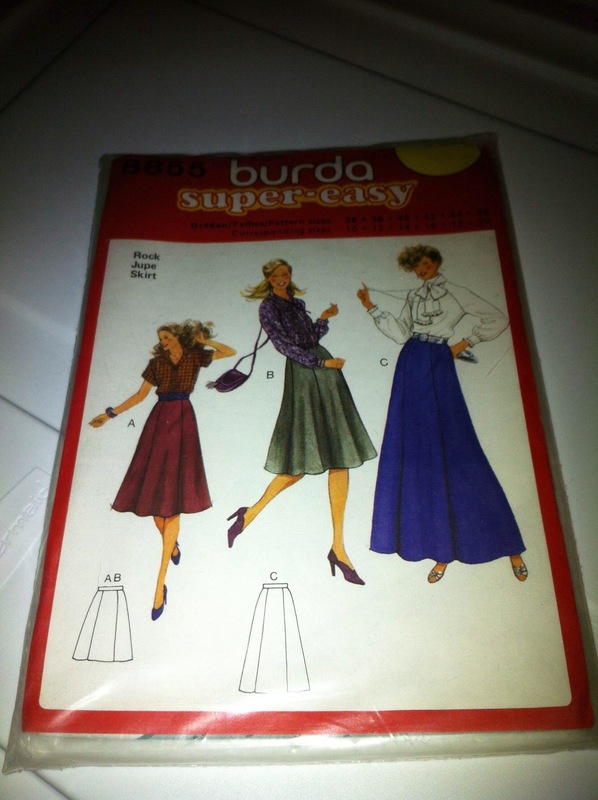 I’ve had Burda 8855 for a long time—it was one of the earlier thrift-store patterns I picked up. And, frankly, it’s pretty damn near perfect: a long, not too full skirt, one of my favourite styles, and one I wear a fair bit when I’m in a “look at me!” point in my fashion cycle. Amidst all the craziness of Hallowe’en sewing, I was yearning to make something for myself, and traced it off. (A 70s vintage pattern, it doesn’t have seam allowances added. Which means I got to add my own, favourite 1cm seam allowance. YAY 🙂 ) Incidentally, the most fun thing about the pattern itself was discovering that it was printed on tissue paper identical in every way to the big Burda-brand tracing sheets I buy by the package at Fabricland, right down to the one shiny side and the precise folding scheme.) As I was auditioning black fabrics for Batgirl’s jacket/cape at Hallowe’en, I pulled out this mystery suiting, a sturdy twill weave that feels like it might have a hint of wool in. 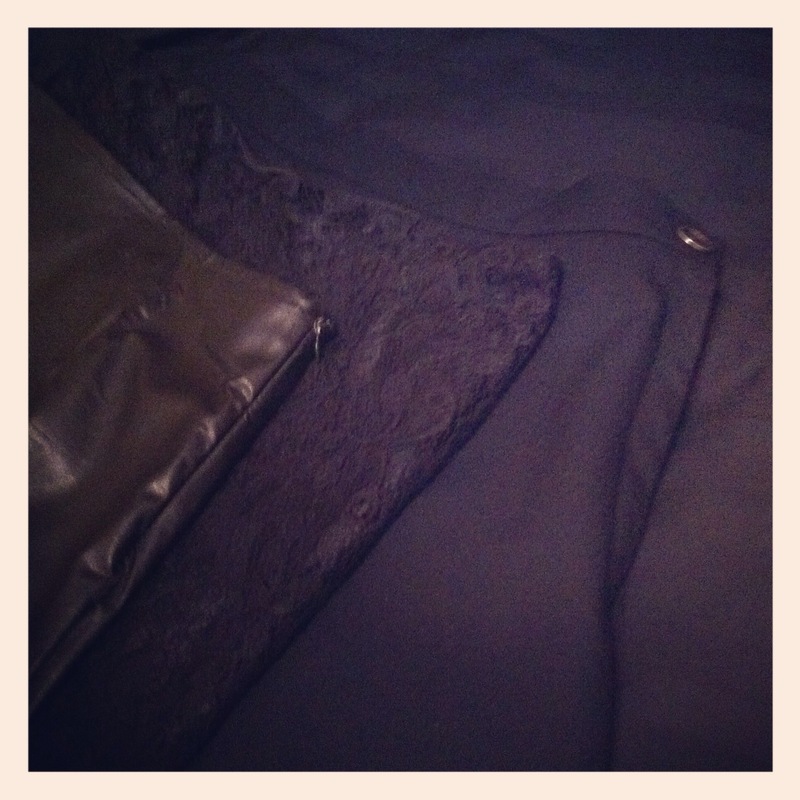 While I went with a leather-look knit for Batgirl, I knew this fabric would make a great, sturdy, plain black skirt. 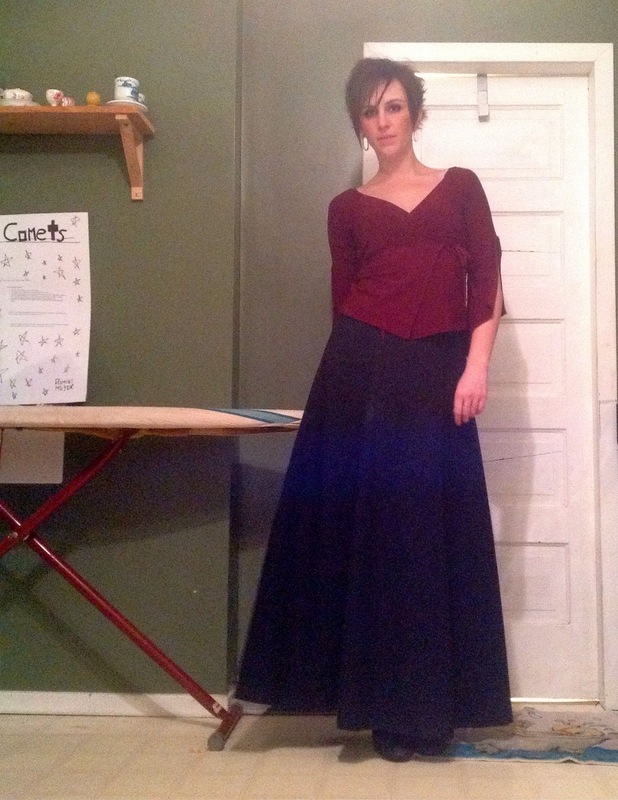 I traced and cut a straight size 38, adding a wide hem allowance to the bottom both because I like wide hems and just in case the length as drafted wasn’t enough (though 70s long skirts are generally fine, for some reason). Once I finally got it constructed enough to try on (there was some sewing together of incorrect sides and other humorous blunders) I trimmed a wee bit off the top to allow for the fact that my waist definitely not size 38, and a wee bit more off the top back in a teensy-tiny swayback adjustment. I often do this in dresses with a waist-seam, but it was interesting to see it happen in a solo skirt, especially since it’s not terribly fitted over the hips. 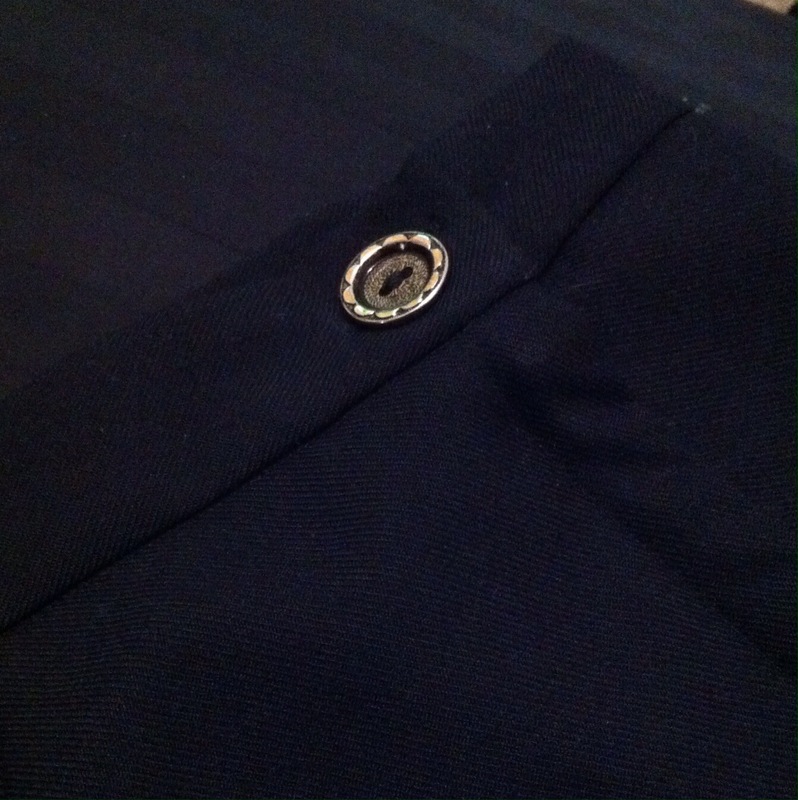 Anyway; side-zip and a waistband. On reflection, while I am coming to terms with skirts that hit at my waist (at least if I don’t try to tuck a top in), I still prefer the look of a facing to an actual waistband. Less bulk in the area where I least need to add bulk. 😉 Especially since this pattern has no back seam so the zipper is at the side. Next time I try this pattern, I will try making a facing for it. Or maybe add a back seam to put the zipper in. Or maybe both. Once I had the top finished to my liking, I tried it on and decided that while the length at the back was good (allowing for a nice 2″ hem), the front could be a wee bit shorter. I trimmed about 1″ off the front, tapering to nothing just past the side seams. 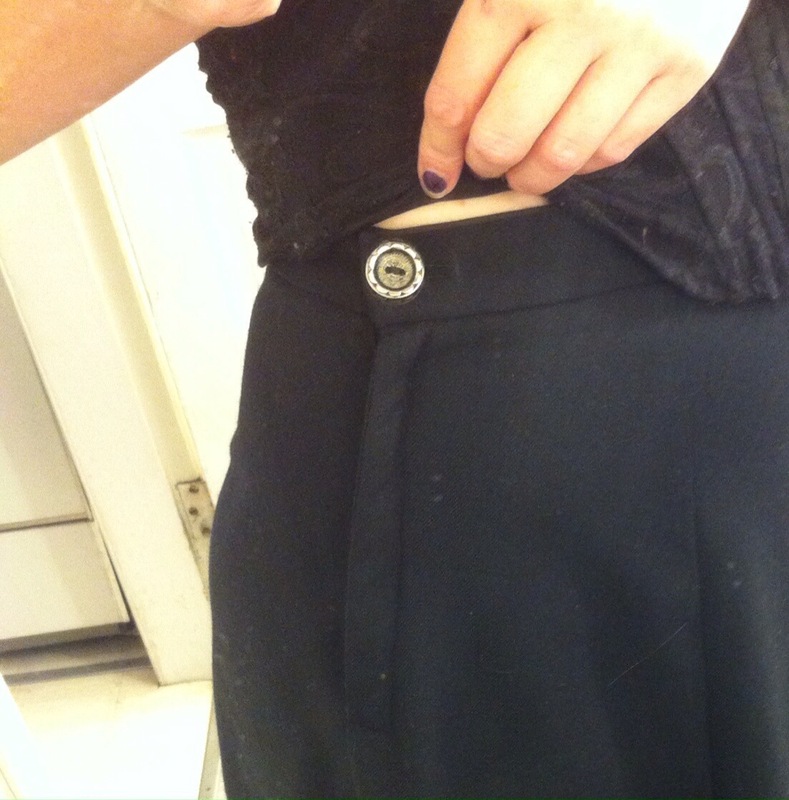 To make the turn-up on the flared skirt, I tried something new to me: I cranked the differential feed all the way up on my serger and serged the bottom edge of the skirt, gathering it somewhat as I went. 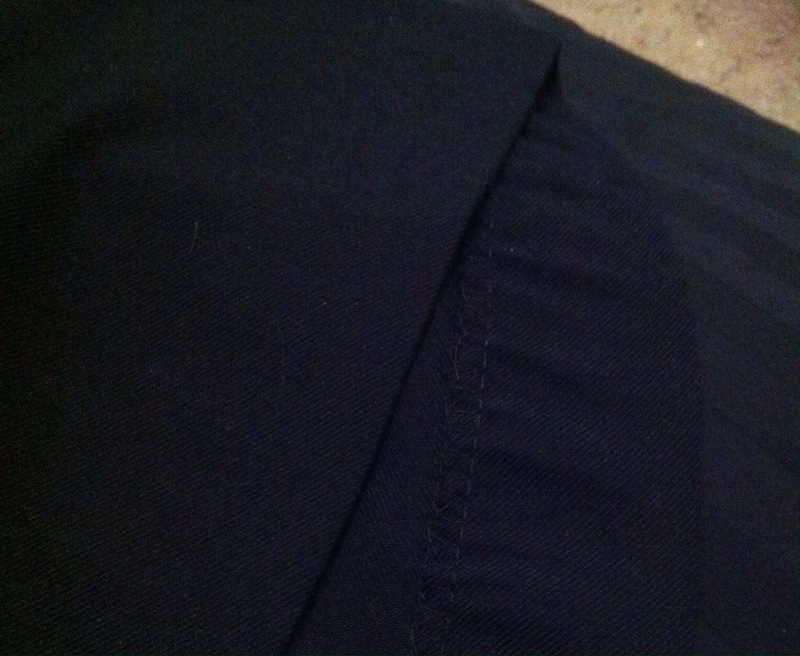 This wound up being pretty much perfect for pressing it up; then I hand-stitched the hem, as I usually do. It’s not terribly smooth or pretty on the inside—a seam binding or other tape would help with that—but it was quick and functional. Quick being a big deal these days. It was a deliciously quick project; IIRC, I traced the pattern on Saturday night, cut and sewed on Sunday, and finished the hem Sunday evening, to wear the skirt Monday morning. Now that is a win. So I’m quite happy with the skirt, aside from some funkiness about my buttonhole on the waistband (buttonhole is not centred but button is, which causes some bubbling at the side, just where you don’t want it.) And It’s been worn a number of times since. I was quite pleased with myself for finally adding such a versatile basic piece* to my closet. 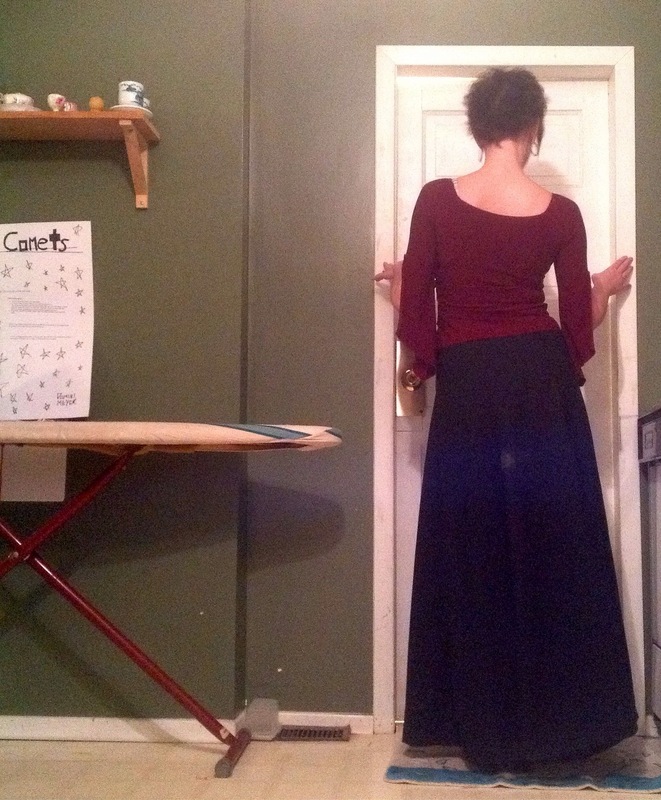 Then, while digging through that closet for things to wear with the skirt, I found not one, but two long black skirts from my pre-sewing days that, um, I had kinda forgotten about. So apparently it’s a staple that I already possessed. I still like my new skirt best, though. I hate waste bands too. Like.. a lot. I do love 70s patterns though and this is a gooder. There is no such thing as “too many black skirts.” Merry Christmas! It looks amazing, so feminine! Loved your description of the process – finally I don’t feel like the only one making adjustments and trying new stuff “on the way”.